Every time you go to the grocery store pick up a can or two and bring it to Peace to put in the Food Bank barrel. The most needed items are peanut butter, wholegrain cereals, hearty soups, beans and lentils, canned tuna and chicken, canned fruit, canned vegetables, brown rice, whole wheat pasta and canned tomato products. Thank you for your generous donations. You will be pleased to know that the Food Bank of Contra Costa and Solano Counties has earned its fifth consecutive 4-star rating from Charity Navigator an honor that is given to only the top 4% of charities nationwide. There are people who are hungry right on our doorstep. In fact, there are more than 100,000 people in Contra Costa County who are eligible for food and nutritional assistance because of low income. The need seems overwhelming but there is one simple way you can make a difference and help. The Food Bank of Contra Costa and Solano Counties is a centralized warehouse that stores and distributes donated and purchased perishable and non-perishable food items. The Food Bank distributes directly to low income people at community sites and they also make food available for other non-profit organizations serving the ill, the needy and infants. Approximately 149,000 people are served each month, a 13% increase from the fall of 2010. One in four people receiving emergency food are children. You can be part of that collection and distribution process. 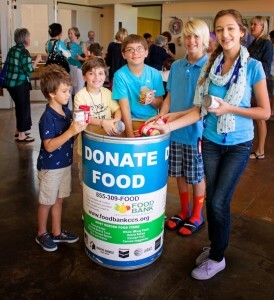 However, contributing to the Food Barrel as important as it is, is not enough. Organizations such as the Food Bank cannot take care of all the hungry people there are in this state and in this country. The government needs to be involved. What we need to be working on are changes at the policy level. Low income people in California may qualify for CalFresh. CalFresh is the new name for the Food Stamp Program and is known federally as SNAP (Supplemental Nutrition Assistance Program). Cal Fresh is a program that helps low-income individuals and families stretch tight food budgets. A monthly amount is loaded onto card that works like a debit card. It can be used to buy food, plants and seeds. Starting November 1, 2013 over 4 million people in California will have less money to feed their families. They are part of the 47 million Americans who will see their SNAP (food stamp) benefits cut due to the end of the American Recovery and Reinvestment Act that passed four years ago. The cut means that a family of four will lose $36 a month from their maximum monthly benefit. Here in Contra Costa and Solano Counties nearly 5 million SNAP meals will be lost each year due to this cut…. But this cut is not the last or the only one. In September, the US House of Representatives passed legislation cutting $40 billion in SNAP over the next 10 years. Together with the November 1 cuts, the pending legislation will result in a loss of nearly 3.4 billion meals for low income Americans in 2014 alone…We can prevent further cuts from taking place. Call your Congressperson and tell them not to cut SNAP. Visit foodbankccs.org to learn more. Please contact Linda Elsdon at newbeginning@elsdon.com for comments on the topic of food insecurity in America.